Albert Schoenhut founded the Schoenhut Piano Company of Philadelphia, Pennsylvania by in 1872 and the business still continues to this day. By his death in 1912 it was the largest toy company in America, making high quality toy pianos, ukulele-banjos, xylophones, and glockenspiels, plus dolls, circus figures, and other toys. The company was left to his 6 sons. They made their father proud by continuing in the same spirit as he did. Harry Schoenhut took over his fathers role in the company. 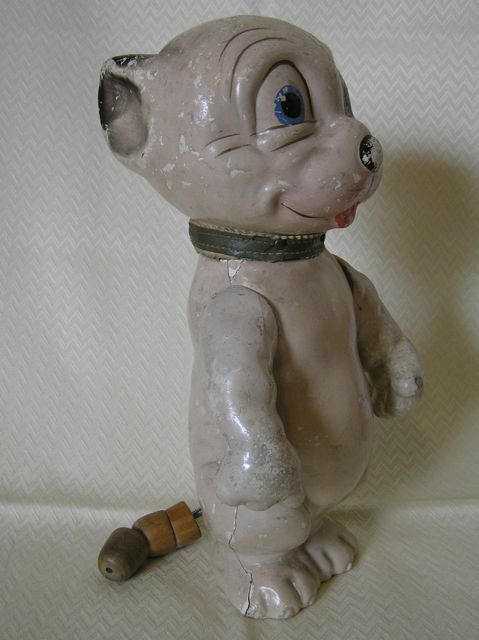 The company made high quality dolls and wooden-jointed circus and comic strip characters, including Bonzo, Felix the Cat, Maggie & Jiggs, Barney Google, and Sparkplug. 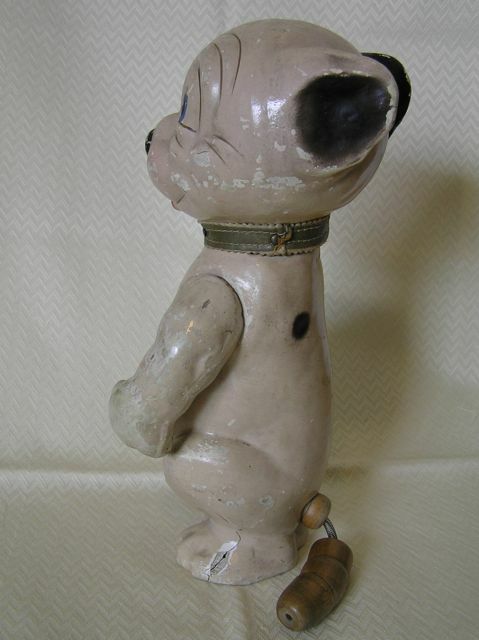 In the 1950s, the firm of Delvan, Seneca Falls, New York, bought the patent rights to the Schoenhut wooden-jointed figures and again produced a series of circus animals. These toys received a lukewarm reception and were not up to the quality and charm of the predecessors. 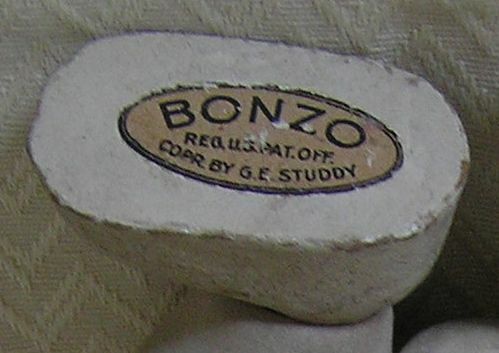 The Bonzo they produced in late 1928 appears to be only in one size and is fully jointed. The head is a composition material, with the rest of the body made of a lightweight wood. It is held together by elastic, which in most examples today is somewhat loose. 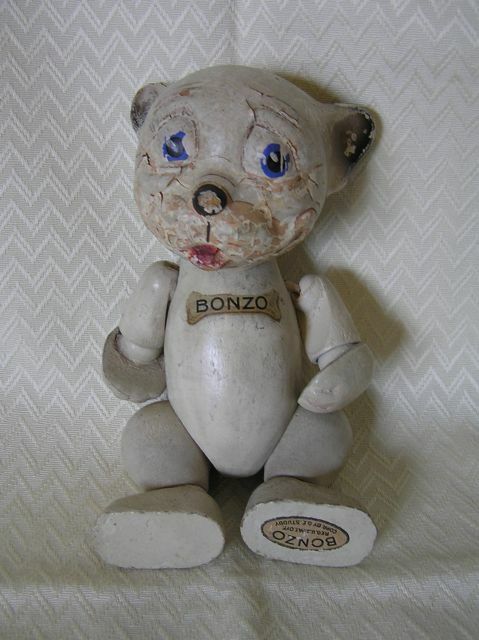 He has his name emblazoned on his chest within a bone, and has an oval decal on the bottom of foot which reads "Bonzo Reg. U.S. Pat. Off. Copr. By G.E. Studdy" so it was an authorized piece. 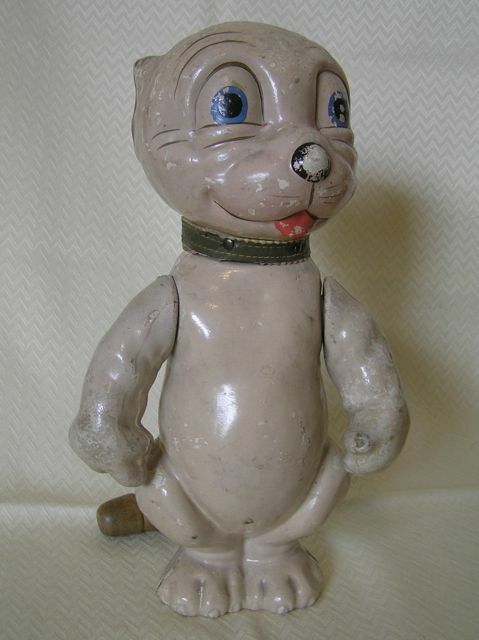 Head to foot, he stands about 7 inches tall, and he is one of the rarer Schoenhut toys to find. A couple of examples of the Schoenhut toy, both showing some degradation to the composition heads. They appear to be particularly susceptible to damage. The decal on the foot, showing the US patent office registry. 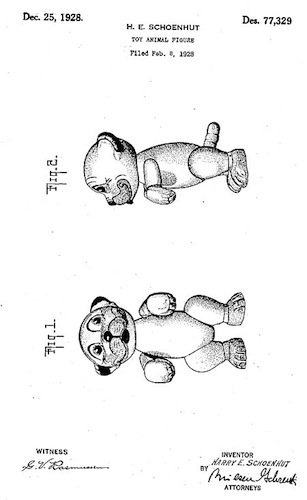 A copy of the US patent that was filed for this toy in February 1928 shows it was Harry Schoenhut who had designed the toy. One of the major stockists for the Scoenhut Bonzo was the famous George Borgfeldt & Company store of New York, and they featured the Bonzo in their 1929 catalogue. In 1922 Joseph Kallus founded the Cameo Doll Company of New York. 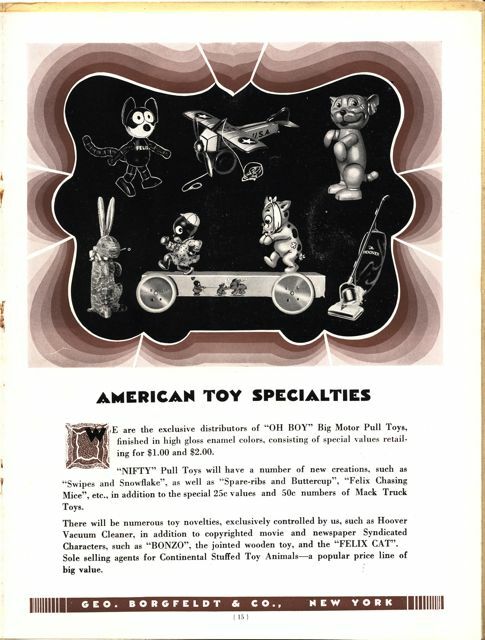 After 1925, Cameo took over producing K and K Toy company doll products until sometime in the 1930s. In 1970 the company was acquired by the Strombecker Corporation and moved to Chicago. The type of dolls made by the Cameo Doll Company were bisque, celluloid, composition with wood or cloth bodies and hard plastic or vinyl and were of the finest quality. They were the sole manufacturers of the composition Kewpie dolls made in the USA, designed by illustrator Rosie O'Neill. 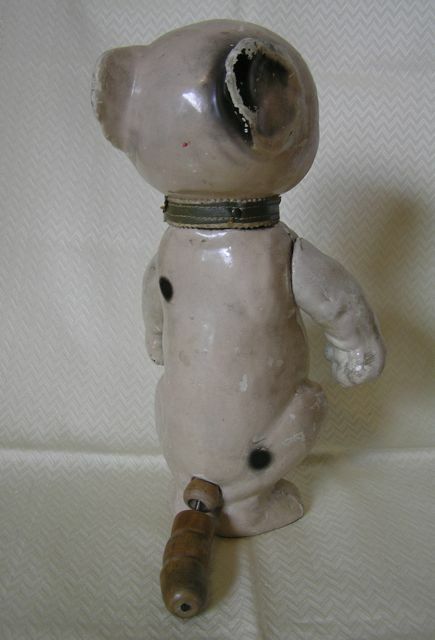 Other early dolls were; from 1922 Bye-Lo Baby (composition heads) by Grace S. Putnam, 1925 Baby Bo-Kaye, 1929 Scootles, 1925 Little Annie Rooney, from 1928 Bonzo, Mickey Mouse and Superman, 1932 Betty Boop, 1942 Disney dolls including Dumbo, Timothy Mouse and Baby Weems, 1946 Giggles and many others. Early Cameo dolls can be unmarked, later dolls are often marked Cameo on their heads, back or feet. The Bonzo made by Cameo is a larger variation of the Schoenhut Bonzo that has a similar appearance, except he is an impressive 12” tall with all composition limbs except for a wood segmented tail. The limbs are not quite as multi-jointed as the Schoenhut one, and are held together by a spring system instead of elastic, with only the head and arms having movement. 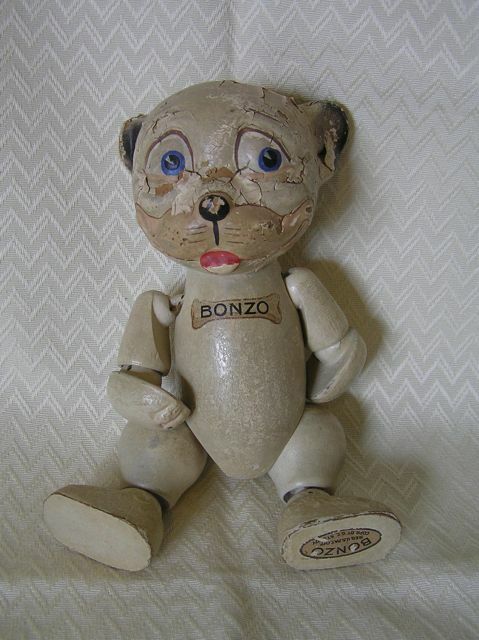 Since this Bonzo is designed by Joseph Kallus in his association with the Cameo Doll Company, one could logically conclude that he may have been the designer for the Schoenhut model as well.